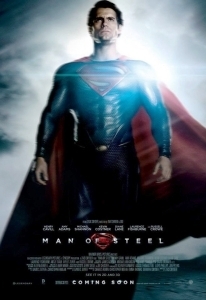 Expectations were high that the Zack Snyder-directed, Christopher Nolan-produced Man of Steel (2013) would finally erase the memory of Bryan Singer’s poor and plastic Superman Returns (2006) and put the last son of Krypton back in his rightful place amongst the blockbuster movie gods. With Nolan’s comic book realism template forged in his Dark Knight trilogy kitchen alongside Snyder’s flair for visual dramatics, it seemed all the ingredients were in the pan and the salivating, cinema-going public were going to be treated to a Michelin star meal. Unfortunately for us, we’ve ended up with a rather chunky dog’s dinner. For those of you who’ve been living on Krypton since birth, British actor Henry Cavill stars as the rebooted Supes. Transported from his doomed home planet by father Jor-El (Russell Crowe) to the Kansas farm of Jonathan and Martha Kent (Kevin Costner and Diane Lane), Clark – née Kal-El – grows up confused by his ability to lift school buses and shoot laser beams from eyes. We first meet him as a bearded wanderer looking for his place in the world, and when his father’s nemesis – the fiendish General Zod (Michael Shannon) – arrives to destroy him and the world he calls home, Clark slips into his skin-tight suit and flies off for a date with destiny. First, the good. Crowe and Costner in particular are solid in their respective ‘dual daddy’ roles, and the scenes of Clark’s childhood in rural Kansas are touching, well-shot and grounded in reality. Those snippets alone prove that Snyder is capable of calm and measured work, and if he’d have had a tiny special effects budget he might have delivered an interesting take on a familiar superhero tale, exploring themes of sacrifice and compassion. Unfortunately, if you give the ‘visionary director’ hundreds of millions of dollars and an arsenal of CGI, the Watchmen director is prone to going postal and firing everything at the screen until the audience begs him for an armistice – or simply ten seconds of peace and quiet. Sadly, screenwriter David Goyer seems to be making it up as he’s going along, throwing random robotic tentacles into the mix and forcing a relationship between Clark and Lois Lane (Amy Adams) that he doesn’t bother to build up to. The editing is similarly woeful, flicking from the past to the present to Zod knows where, with chunks of scenes seemingly being ripped out; Snyder carries on regardless, hoping, perhaps, that nobody will notice. In terms of performances, Shannon is no great shakes as the shouty villain and Adams does little with a thankless role. As for Cavill, he certainly looks the part but lacks crucial charm and charisma, surely the two essential qualities any ‘Man of Steel’ needs. Grumpy film critics whining about comic book adaptations is never an attractive prospect, and younger audiences may well find something to enjoy here. Unfortunately for more mature audiences, Nolan and Snyder’s love child not only falls flat, but also degrades the character/cultural icon even further than Singer’s rendition. During the war years up until the late 1970s, this idea of a messianic hero who believed in truth, justice and the American way resonated within the public psyche. For better or for worse, however, times have changed and Man of Steel’s man in the cape seems like a relic of the past, hopelessly trying to find his place in a world that’s already passed him by.